The HIARNG Environmental Office is seeking retirees from AASF2 (Hilo), MATES/UTES (Waiawa), CSMS1 (Fort Ruger). A Preliminary Assessment is being conducted to assess the extent of Per-and PolyfluoroalkylSubstances (PFAS) use at these locations. The PFAS compound is an emerging contaminant of concern. Commonly used DoD PFAS-containing products include aqueous film forming foam (AFFF), firefighting agents, and chemical fume suppressants. The Preliminary Assessment will obtain the information needed to determine whether further action at a site is necessary or if a site can be removed from further consideration for response. Come talk story and reminisce at the ​Henry S. Hara (Ret) AFRC in Hilo on ​4/29/2019, or at the 29 IBCT building in Kalaeloa on 4/30/2019. If you are interested in being interviewed, please contact Ms. Leslie Chau by phone at (808) 672-1276, or by email at leslie.t.chau.nfg@mail.mil. 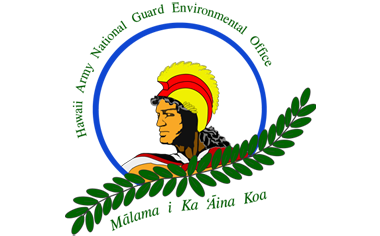 The mission of the Hawaii Army National Guard Environmental Office is to provide policy, technical assistance and guidance on issues governing the Army’s pillars of Environmental stewardship. The staff supports Hawaii Army National Guard’s challenge of providing realistic military training to Guard members on five Hawaiian Islands by implementing training, compliance, conservation, pollution prevention and awareness programs to minimize the impacts of training on the environment, and by complying with regulations to ensure that environmental protection is an integral part of the Guard’s decision-making process.